It is a well-known fact that the wind does not blow and the sun does not shine with a steady intensity. This poses a major issue when it comes to the power grid wherein the power supply and power demand must go hand in hand. As part of the EWeLiNE project, Germany‘s National Meteorological Service in Offenbach and the Fraunhofer Institute for Wind Energy and Energy System Technology (IWES) in Kassel have been working together to build mathematical models that could help to predict the production of renewable electricity. The partners have now introduced a new platform that can be used by transmission system operators to test the new forecast models live in their control centers. The new mathematical models create forecasts that are precise enough for each quarter-hour, showing the amount of electricity that will be generated by Germany’s wind-farm and photovoltaic facilities over the next several hours and days. It’s crucial for us to interconnect both worlds – forecasts of weather and power – more closely than before, tailoring them better to the requirements of the transmission system operators. Germany’s main power lines make up the 380 and 220 kV, high-voltage grid. These power lines are operated by transmission system operators, who bring electricity to consumers, sustain the power grid, and expand it as required. The major project was started at the end of 2012. 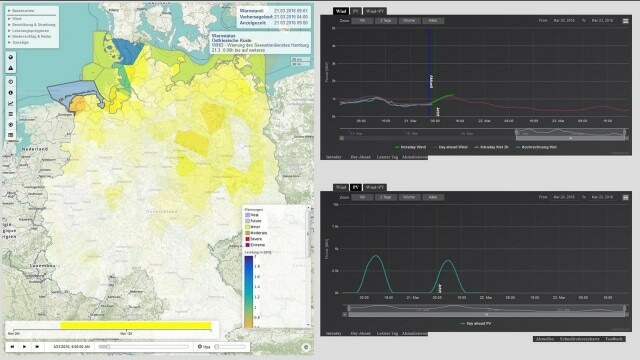 Fraunhofer and the German Weather Service have now launched a new demonstration platform known as EnergyForecaster. Transmission system operators can now use this platform to test the latest forecast models live in their control centers. While these operators almost know the amount of electricity that would be required by consumers over the day, they only have a rough idea of how much of electricity, generated by wind farms and photovoltaisc systems, would be fed into the grid. It’s important to forecast how much renewable power will be generated, because that tells us how much conventional generation capacity – whether nuclear, gas, or coal – needs to be brought online. At the same time, the forecast is necessary for calculations to keep the power grid stable and for trading electricity. The demonstration platform provides new types of forecasts that will aid transmission system operators to accurately determine the amount of solar and wind power that would be fed into individual grid nodes. There are also other new tools that include data about the forecasts’ reliability. “The transmission system operators also have to be aware of any critical weather conditions – for example, patches of low stratus or low-pressure zones – so they can better analyze and estimate the forecast results,” says Siefert. The researchers also benefit from the EnergyForecaster, as it shows them how their innovations perform in the real world. “We believe that more potential for optimization, as yet unrecognized, will result,” says Siefert. “It’s crucial to calculate precisely how the 1.9 million photovoltaic facilities and wind farms operating in Germany will convert the weather into electricity,” says Siefert. The main issue is that information is not available for such systems. In some cases, data privacy laws prevent us from gaining access, while in others we simply lack the technology to continuously record how much power the unit feeds in. As such, mathematical models are being developed by IWES to enhance the forecasts of all wind farms and photovoltaic systems installed in Germany. The results obtained were reconciled with the currently available data and optimized for a wide range of applications. The researchers then separated over 40 forecasts, which are presently used by transmission system operators, into 16 groups and then methodically enhanced them. “Our objective is to combine several different methods for each application to take advantage of their various strengths,” says Siefert. In the meantime, the DWD is using its weather forecasts to fulfill the power forecasting needs. We performed detailed meteorological analyses of the occasions when forecasts of power feed-ins to the grid proved most inaccurate. From these analyses we then derived improvements to our weather models .With the systematic adaptation of our weather forecasts as a basis for wind and photovoltaic power forecasts for the electric grid, the German weather service has taken on a new and supplementary role.